State spending on K-12 education rose over the past year despite lackluster tax collections, as budgets continue to tick upward from the abyss of the Great Recession. Funding in the states for education increased by 4 percent in fiscal 2017, a bump from 2.9 percent a year before, according to a report released today by the National Association of State Budget Officers. “K-12 is one of the last areas states want to cut. They see the value of it,” said Brian Sigritz, the association’s director of state fiscal studies, in an interview. In another measure included in the report, states’ median general fund spending for K-12 education rose by 3.6 percent from fiscal 2016 to 2017, roughly the same amount it did the previous year. For the vast majority of states, fiscal 2017 covers the period from July 2016 to June of this year. In the information it collects, NASBO does not specifically ask states to include or exclude pre-kindergarten spending in their K-12 totals, Sigritz said. It is likely that many states include pre-K, he said. States spent a total of $385 billion on K-12 education in fiscal 2017. 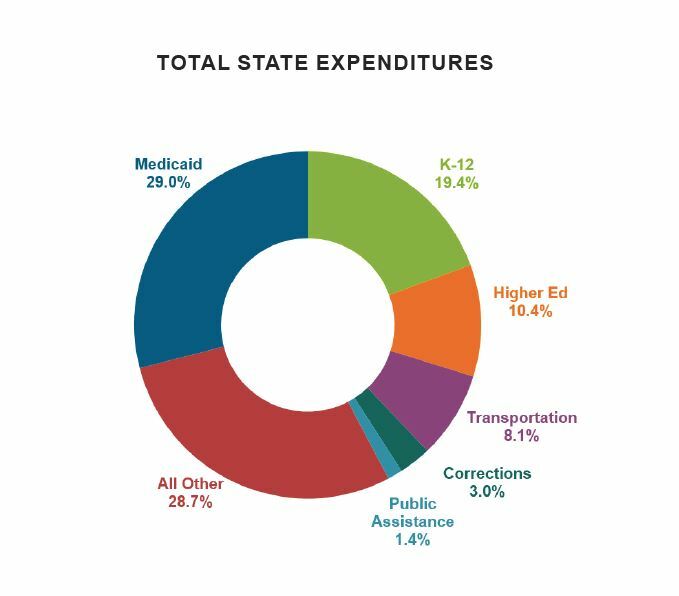 School spending continues to represent the biggest chunk of state general fund spending, at 36 percent, according to fiscal 2016 estimates. Medicaid took up the second-largest share, at 20 percent, followed by higher education at 10 percent. Some of the new money states are pouring into education is going to raising teacher pay, NASBO said. In a few cases, states are raising overall K-12 funding–and the equity of spending across districts–in response to court mandates. Early childhood education is also receiving an infusion in some states, the association said. To the extent that individual states prioritized K-12, many of them were not helped by weak tax revenues filling their coffers. State general fund revenues grew by just 2.2 percent in fiscal 2017, following 1.8 percent growth in fiscal 2016. Over three of the past four years, state revenues have grown only incrementally, or declined, according to the association. The median growth rate in sales tax collections–which makes up about 30 percent of states’ general fund revenue–was 2.5 percent in fiscal 2017. Corporate income tax collections, meanwhile, declined this year for the second straight year. The Great Recession officially lasted 18 months and ended in mid-2009. But it exacted a severe toll on budgets in education and other areas for years afterward, as state and local economies withered and tax bases collapsed. Congress, at the urging of the Obama administration, sought to ease the pain by providing federal stimulus aid–most notably a $787 billion recovery package in 2009 that included $100 billion for education. Two big spending commitments–pension costs and Medicaid, the state-federal program that provides health care for the poor–are putting pressure on state budgets, said John Hicks, NASBO’s executive director. The share of state spending consumed by elementary and secondary education has fallen from 22 percent in fiscal 2008 to a little more than 19 percent in 2017. That’s not because K-12 spending has decreased, but because Medicaid is consuming a larger share of the pie, notes NASBO. Medicaid has risen as a portion of total state spending from 20.5 percent in fiscal 2008 to 29 percent in 2017, a increase that can be partly attributed to the growth of coverage through the Affordable Care Act. Yet despite those costs, “governors and legislators are continuing to [make] elementary and secondary education a high priority,” Hicks said. NASBO’s overall estimates of state spending were skewed slightly by a budget impasse last year in Illinois, which depressed national spending estimates last year and inflated them slightly this year. Total state spending across all areas of government, including education, rose by 4.6 percent in fiscal 2017, when Illinois’ numbers were excluded. There was growth across all eight geographic regions broken out by NASBO. In K-12 education, spending rose in the majority of individual states, NASBO found.